Most individuals now use tablets every day. Companies are also providing their employees with tablets for their commercial tasks. Salespeople and sales managers can use this new tool to track all commercial activities, create campaigns, and manage contact databases, etc. Based on this, Cap Vision has created a CRM app for tablets. 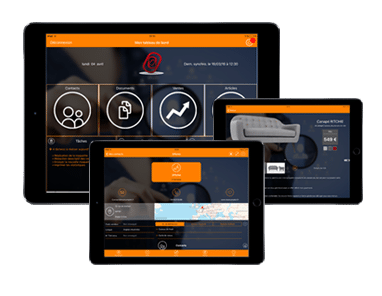 Used with the Microsoft Dynamics NAV ERP, the CRM app gives users high-performance tools at their fingertips: manage schedules, meetings, and tasks, keep track of communications that day, access the contact database, and manage appointments, etc. Keep in contact with your employees and current and prospective customers 24/7. The CRM is an indispensable ally for your sales force. DO YOU NEED A CRM APP ?